The Cabaret opens at 6pm for pre-show dining. Inquire about vegan and vegetarian specials. Side dishes of seasonal vegetables available. Germano's homemade desserts also available in the Cabaret. Crepe filled with spinach and ricotta cheese. Mixed greens tossed in our housemade balsamic vinagrette topped with diced tomato, onion, and fresh mozzarella. Homemade ravioli filled with red beets and roasted garlic, sauteed in veal stock reduction and topped with mushrooms. Linguine sauteed with garlic, extra virgin olive oil, capers, peperoncini, olives, artichokes and tomato with a touch of anchovy. Breast of chicken sauteed in a light Marsala wine sauce and wild mushrooms. Braised shank in a light brown sauce with white wine, tomato and herbs, served over risotto and topped with sauteed mushrooms. Whole fresh Mediterranean bass fire-grilled in aromatic herbs. 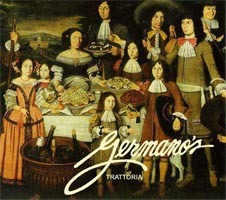 Germano's serves a selection of Belgian Beers, as available.